γ-PGA is more Hydrating than Hyaluronic Acid / more elastic than Collagen. 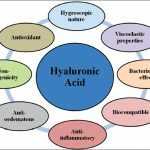 γ-PGA is more Hydrating than Hyaluronic Acid / more elastic than Collagen…. γ-PGA is the best Hydrating Agent, for skin and hair care, ever discovered …. γ-PGA can also be used as an anti-aging Skin Filler…..
γ-PGA is a wonderful and natural agent, ideal to enhance the effects of health care & skin care products. γ-PGA is integrated into the basic skin care product formulation. It dissolves excellently in water. Your can feel the difference on the soothing, refreshing & moisturizing effect immediately! FAST MOISTERIZING & REFRESHMENT! γ-PGA IS ALL NATURAL!! Originally the substance was discovered in the marine jellyfish. Which helps the jellyfish to store water in its fragile tissue and therefore dose not dehydrate in salty sea water thanks to γ-PGA. A new development for best moisturizing results γ-PGA and polyglutamates are naturally occurred biopolymers with multifunctional ties. γ-PGA is biosythesized from L-glutamic acid with the microbe “Bacillus subtilis var natto” which has been one of the microbes used to make „Natto“ – fermented soybean, a traditional food and very popular in Japan for over 800 Years. γ-PGA is edible, biodegradable, non-toxic to human body and good blood compatible. Its characteristic multi-carboxylic functional groups make it polyanionic bioploymer which has been highly proposed and recommended for use in several fields as…. γ-PGA fills up the los of moisture in the skin and has the ability to keep moisture longer in the skin. γ-PGA – hydrogel γ-PGA powder Water After 3 to 4 minutes the water becomes a gel γ-PGA has the incredible capacity to bind water. Up to 5000 times it’s own molecular weight What is γ-PGA? Polyglutamic acid solutions have the abilities of skin miniaturization and of melanin inhibition. The molecular weight of polyglutamic acid can be reduced efficiently by HCl hydrolysis. The viscosity of low molecular weight of polyglutamic acid solutions are not affected by pH values. When polyglutamic acid is added to emulsion, the particle size of emulsion is reduced and the ability of skin moisturization of the emulsion increases. Polyglutamid acid can be used as an excellent ingredient for skin moisturizers. The material γ-PGA Hydrogel is with unique surpassing moisture holding capability, combining with functions of different molecules of γ-PGA, can develop longer time of one-way slow release action to thoroughly infiltrate encapsulated active ingredients into deep layer of skin. That’s why γ-PGA can quickly fill the gaps between skin cells, diminish the pores and re-firm your facial skin within a moment!. γ-PGA is not only an hydrating ingredient for skin but also a good “ carrier “ for other ingredients! γ-PGA with abundant of negative charges is so good for binding with positively charged trace elements provide the optimal adhesion to the skin which is normally negatively charged. It is a proven fact that the moistur- izing capability of is 10 times more than that of Hyaluronic Acid! New research reveals – Our top layer of the skin, the stratum corneum, takes its oxygen straight from the air & surrounding. But only moist skin can efficiently absorb oxygen to supply the skin cells. Skin moisturizing is crucial. 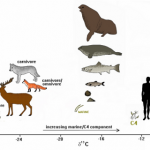 The skin surface gets its oxygen from the atmosphere, not the blood! Insufficient oxygen supply to the cells reduces the natural moisturizing ability of the skin significantly. Markus Stücker of the Ruhr-University in Bochum, Germany, and his dermatologist colleagues have found that air supplies the top 0.25 – 0.4 mm of the skin with oxygen. This is almost 10 times deeper than previous estimates. This zone includes the entire outermost layer of living cells – the epidermis – and some of the dermis below, which contains sweat glands and hair roots. The finding could change skin care specialists approach to skin conditions. Says David Harrison, who studies the use of oxygen by the skin at the University Hospital of North Durham, UK: “Everyone thought that atmospheric oxygen was unimportant, but a significant depth of the skin is supplied from the air and environment.” This fact opens new aspects on using skin care products containing γ-PGA! •Hyaluronic Acid and collagen as cosmetic agents are animal based and for many cosmetic users out today. Solution – The patented γ-PGA is plant based and more Hydrating than Hyaluronic Acid Hyaluronic Acid reduces, after longer application, the cells natural moisturizing factor of the skin. Additionally γ-PGA A provides more elasticity to the skin than Collagen. γ-PGA can therefore also be used as an effective anti- aging Skin Filler γ-PGA is today’s best choice for skin hydration. γ-PGA is the best & most powerful Hydrating Agent ever discovered! Then contact us: FIBD GmbH Wolleraustrasse 41a CH-8807 Freienbach Switzerland Email info@fibd.biz Web www.fibdbusiness.com Interested in this product line? Polyglutamic acid (PGA) is a polymer of the amino acid glutamic acid (GA). 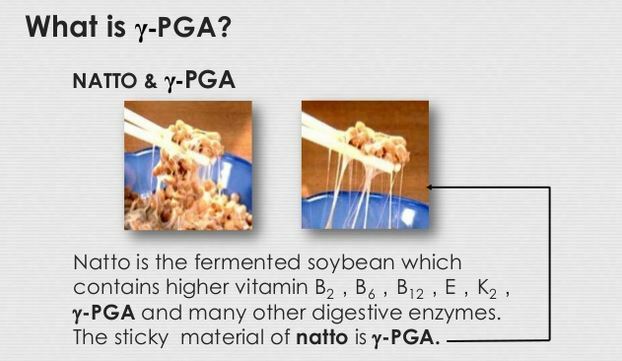 Gamma PGA (Poly-γ-glutamic acid, γ-PGA) – the form where the peptide bonds are between the amino group of GA and the carboxyl group at the end of the GA side chain) – is a major constituent of the Japanese food natto. Gamma PGA is formed by bacterial fermentation.